It's been part of the Belfast skyline for six decades and is a key part in the communications infrastructure of Northern Ireland: the Divis transmitter site came into service 60 years ago today, when it became the first permanent TV transmitter site on the island of Ireland. On 21st July 1955, the BBC launched 405-line VHF TV transmissions from the site, sitting between the summit of Divis Mountain and Black Mountain and overlooking a vast swathe of eastern Northern Ireland. Divis replaced a temporary site at Glencairn, which had been rushed into operation in May 1953, in time for the television coverage of the Coronation of Queen Elizabeth II. Since the launch of a solitary VHF TV service in the 50s, the site at Divis has seen a massive expansion in the number of TV and radio broadcasts to Northern Ireland, with the transmitter site now home to two masts and carrying nine Freeview multiplexes with over 60 TV channels, plus national FM and DAB digital radio transmissions. In terms of television, Divis carries more services than any other transmitter site in the whole of Ireland. 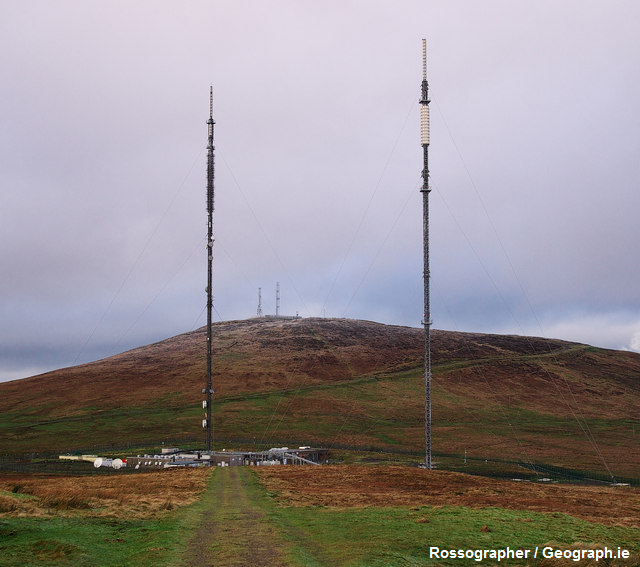 In its early years, Divis faced competition for the supremacy of the airwaves when the Independent Television Authority erected a mast at nearby Black Mountain to carry Ulster Television from 1959. With the switch to UHF and colour transmissions, Divis became home to all the national TV networks. 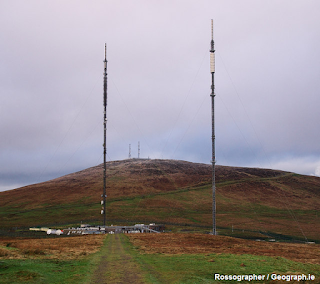 In time, additional main UHF transmitter sites were set up at Brougher Mountain and Limavady alongside a chain of relays bringing TV to almost all of Northern Ireland. BBC Two Northern Ireland began regular transmissions from Divis on 18th March 1967. BBC One Northern Ireland and UTV launched in colour on UHF in September 1970. Channel 4 followed in 1982. Channel 5 never broadcast in analogue from Divis - Black Mountain was chosen as the main Channel 5 analogue transmitter site. In 2012, digital switchover reached Northern Ireland. Although digital TV services had been in operation since 1998, they had to broadcast at low power, so as not to interfere with existing analogue TV services in both Northern Ireland and the Republic of Ireland. In preparation for the digital switchover, a new 156.8 metre high mast was constructed at Divis to carry post-switchover digital terrestrial TV, plus DAB broadcasts, standing alongside the slightly shorter old mast, which is used for FM radio. The last analogue channels were closed down just before midnight on the 23rd October. A few hours later, during the morning of 24th October, HD TV arrived at the transmitter, coinciding with the launch of BBC One Northern Ireland in HD. UTV HD, having launched on cable only in 2010, became widely available across Northern Ireland. Divis now carries nine Freeview multiplexes, three of which have launched since digital switchover -: HD multiplexes COM7 and 8, plus the local TV multiplex that carries Belfast's NVTV. It's the only transmitter site in Northern Ireland to carry these additional multiplexes, giving viewers across the east of Northern Ireland the largest choice of Freeview channels in the province. Just Irish channels from RTÉ and TG4 are absent from the site, coming from neighbouring Black Mountain, or received in some areas direct from south of the border.